This Yamaha F70 was new in the box in November, 2011 and currently has 712 hours. Oil changes were done every 100 hours and with new impeller and thermostats installed by Gulfside Marine on Matlacha every 200 hours. The engine still runs perfectly and I'm simply repowering my BT3 with a new F70. NADA average retail on this motor is currently listed at $6100. I'm asking $5500 obo without the prop. There are very few of these used F70s on the market and new ones retail for $8900. This has been a fantastic outboard that cruised my skiff at 28mph and only burned 3gph. It has several thousand hours of Yamaha reliability left in it. E-mail me at gmckee1@hotmail.com or call 239-565-2960. My buddy Sam Peplinski from Atlanta landed this beautiful 9 lb. red out in Orange Pass today on a white Gulp Shrimp. Despite the excellent tides the redfish bite has been really slow over the past several days. This was the first over-slot red I've seen in more than a week even though we've had a ton of bait in the water and above normal temps. Another front is hitting us tomorrow but don't let that discourage you for looking for fish like this on the incoming tide, especially in the north part of Pine Island Sound. Gavin, Brennan, and their dad Keith crushed the trout in Matlacha Pass. Our last afternoon of near record warm temps really kicked the trout into gear. With a near record high of 85 yesterday and a late incoming tide, some big fish were hanging in their usual grassy spots in the north Pass. Everywhere we found mullet jumping around we also found the trout. White Gulp Jerk Shads are my favorite artificial for these fish and yesterday they actually worked better than live shrimp. It's going to drop back into the low 50's on Christmas day, which is actually close to normal for this time of year, so expect a bit of a slow down for a day or two until they readjust. A nice one from today. My buddy Capt. Mike Bartlett shared this with me yesterday and it's something I doubt anyone else has ever filmed before. It's definitely something I've never imagined seeing in all my years down in the Keys. "It followed me home, Mom! Can I keep it?" 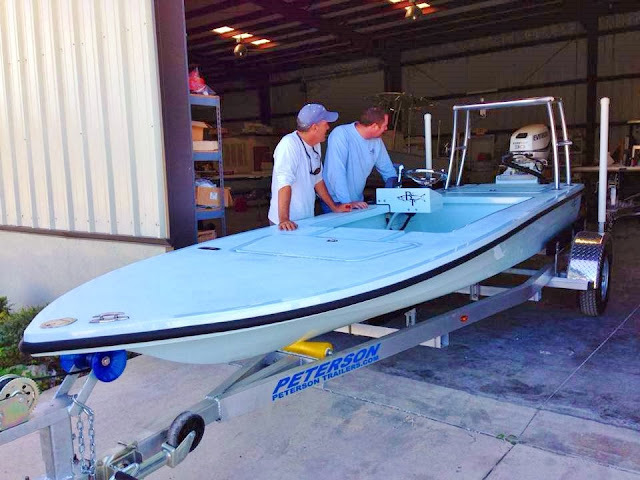 My friends Will and Liz up at Beavertail in Palmetto, FL have loaned me one of their latest 2014 Micro skiffs and I have it here on Pine Island to hit some of our negative-low flats for tailing reds and then show it off a bit. I'll be at Cape Tool and Tackle's annual open house and pig roast on Saturday, the 14th starting at 10AM. This is a really fun event thrown by one of the best bait and tackle shops in the area and located at 405 NE Pine Island Road in Cape Coral. There will several different seminars by local captains and some good deals in the tackle shop but the $5 plate of wild hog is more than worth the trip. We unfortunately had to scrap plans to hold a full Demo Day on Matlacha this Sunday since Will and Liz are swamped with boat orders that need finished by New Years. Their crew is practically living at the shop these days. They also have two brand new Beavertail models in the works that will hopefully debut at the Miami Boat Show in Feb. I can't tell you much about them yet but when these two boats join the lineup in 2014 Beavertail will be the King Of The Hill as far as the inshore market is concerned. A couple of terns and a very cooperative osprey from yesterday. It was a little slow out in Matlacha Pass this afternoon during the incoming tide but the few fish we landed really decent. The 29" redfish went back in the water to make more redfish and the 22" trout went onto my grill to make dinner. Both of these fish hit white Gulp Jerk Shads. Absolutely gorgeous out there with near record warm weather and very low humidity. Great week coming up, too. This is a shot I took about fifteen minutes after sunset tonight. We were there to see Santa but once again my daughter wouldn't go anywhere near him. I guess he is kind of intimidating but this scene was worth the trip. December means one thing to me as a fishing guide here on Pine Island: negative low tides. Seeing that little minus symbol in front of the water levels on the tide chart, especially when the lows happen in the early mornings and just before sunset, is almost as good as finding presents under the tree on Christmas morning. These are some of the best conditions to chase tailing redfish and almost every day this month has a tide of 0.0 or lower. For die hard skinny water anglers this is as good as it gets. My favorite times to hit these ultra-shallow flats are about an hour before the bottom of the tide and then the first two hours of the rising water. This is when I usually find the redfish feeding most aggressively since their prey, which is mostly crabs and finger mullet, is easily pinned to the bottom. This is also when the reds stick their tails straight up into the air and start waving them like signal flags. It’s easily one of the coolest things you can see out on the flats. 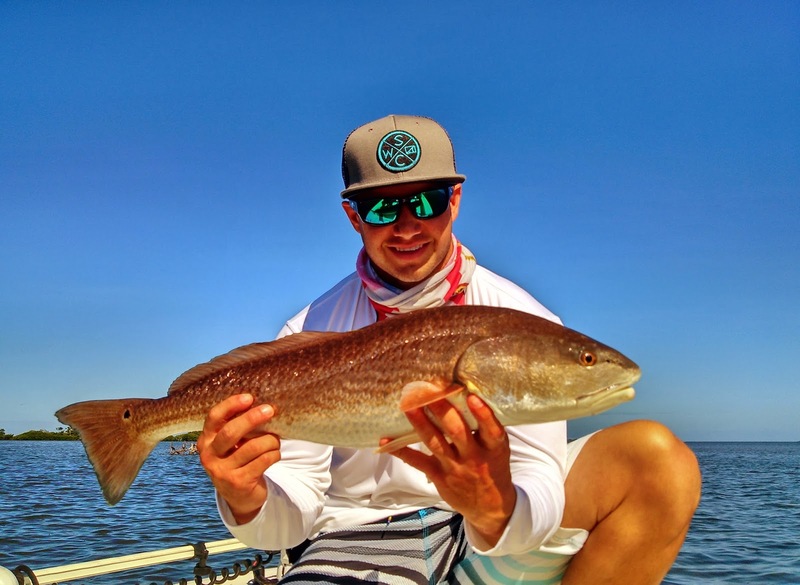 One other thing to look for out there that will help you find hungry redfish are cruising stingrays. The bigger rays attract them like a magnet on certain flats in Pine Island sound and I’ve seen more than a dozen reds hanging on their backs waiting for a crab to flush from underneath. This is also a common behavior for other species of gamefish so it’s not a bad idea to toss a lure or fly at any passing ray. Some of the biggest trout and jacks I’ve ever seen have been landed this way. The rays are easy creatures to spot on the negative low tides, too. Just look for the large pushes of water or even their wingtips poking above the surface. One last thing to know about working schools of fish on a falling tide is to obviously approach them with caution, and I don’t mean that in order to avoid spooking them. The water during a negative low can disappear for a long time, especially on a windy day after a cold front. It’s very easy to get shoved up onto a flat or pole your way into an area while you’re chasing tailers and not get back out, even in a very light skiff. This would be a really miserable experience if it happened at sunset. Keep in mind that the numbers you see on a tide chart are predictions and nothing more than that. While very accurate, the depths and times of posted tides can vary significantly, especially when strong winter weather happens. Keep that in mind when you’re fishing around negative lows this month and you’ll keep yourself out of trouble. 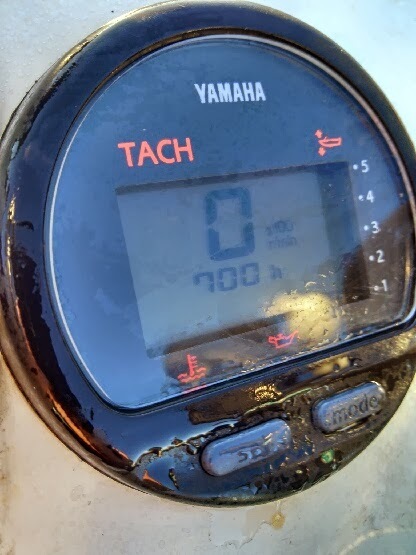 I brought my 2012 model BT3 home from the factory two years ago today and the meter on my Yamaha F70 happened to read exactly 700 hours on this morning's charter. Both the skiff and the outboard have performed better than I expected on the hundreds of trips I've run in that time. Keep in mind that the average recreational angler only puts about 100 hours on their boat each year. The hull of my BT3 is no longer flawless. There are more than a few nicks and scratches in the gelcoat and a couple of really good gouges here and there, all of which are my fault. Put any fishing boat in the water close to 500 times and you're going to get some war wounds, especially with all the oyster bars and worn out docks in this area. But one thing you won't find anywhere on my skiff are spider cracks in the gelcoat, which are a sign of weak points and flex in the hull. I've run my Beavertail across some really rough chop in Charlotte Harbor in the last two years and there's no sign of weak spots or flexing anywhere. I've seen (and owned) other high end skiffs that developed spider cracks after just a few months of use. My Yamaha F70 has run almost flawlessly over its 700 hour life. I say "almost" because I picked up a tank of contaminated gas a couple months ago that would have knocked out any engine. (Thanks a lot Shell station on NW Pine Island Road.) The injectors got really fouled but once my local mechanic jumped on them I was back on the water with no lost charters. Other than that, this current F70 has performed great and still cruises the BT3 along at 28 mph while burning just under 3 gph. I do plan on swapping this current outboard for a new one in the next month or so but that's more of a business decision and has nothing to do with my trust in its reliability. In fact, there are dozens of commercial mullet and crab fishermen in this area that have racked up thousands of hours on their Yamaha outboards. Overall, I still can't say enough good things about the BT3 and Beavertail as a company. I'm a huge fan of everything they build from their newest little Micro on up the offshore Aeon 23. Their 17 foot Strike is probably the best selling technical skiff on the market right now and the boat I would seriously love to own. Will and Elizabeth Leslie have done an amazing job with their lineup in a very short time. Beavertail's sales have gone through the roof this past year and are clearly giving their two bigger competitors a run for their money. Just before our temps were set to plummet on Thanksgiving morning, we had one really good morning in the south part of Matlacha Pass. Melissa and Eric from North Carolina came back to Pine Island and landed a pile of reds, two snook and one nice trout with me this morning, all on Gulp shrimp fished under the mangroves. Even if it gets as cold as predicted things will warm back up quickly and next week with its morning low tides should be excellent. I'm really looking forward to December here on Pine Island. Negative low tides in the mornings gave us several perfect days to throw flies at tailing reds in both Matlacha Pass and Pine Island Sound. Minnesota angler Reed Saunders, who just recently became a local snowbird, landed this excellent 27" beauty on fly with me yesterday near Cabbage Key. He was casting a Dupre Spoon fly at this fish which was digging up the bottom in just over a foot of water. Reed used the same pattern to land a 20" red in even shallower water an hour earlier that morning. Sight casting to these fish is best accomplished when the water is as low as possible and the tide is just starting to flood. If this happens in the mornings, starting about an hour after sunrise, then that's even better. We've had these conditions all week and the cloudless blue skies have helped out tremendously. Next week's tides aren't so hot in the mornings but the first week of December is going to be perfect. I've still got a few days open then so give me a call if you want a shot at a big tailing red. A good friend just hooked me up with a box of inshore patterns from 239 Flies, (which was also a much nicer gesture than I deserved.) I saw these online a few months ago and thought they looked great but had no idea how really well made they are. I'll be trying them out on some low tide redfish and snook during the next few days and I'm sure they'll get their share of eats. Check out his website here and pick up a few for yourself. If your fly box looks like mine in the photo above, there isn't much you can't catch on the flats. We've been covered up by redfish over the last 48 hours but getting them to eat has been a real chore for me. They've been tailing on the flats in Matlacha Pass and clinging to the backs of stingrays in Pine Island Sound so finding them hasn't been a problem. They just don't seem to want the artificials that my anglers have been tossing at them, except for the Gulp shrimp. That's what the 26 incher in the photo above ate today for my buddy Tyler Davis just south of Cabbage Island. It was a gorgeous fish but we had to work way too hard to catch it. Just one of those days. All of these 20" plus fish were caught north of Matlacha during the afternoon falling tide. Far from the best conditions but the results haven't been too bad this week. I just spent a cloudy afternoon catching trout off Matlacha on my neighbor Bob's old Whipray. His boat is one of the very first skiffs built by Hell's Bay back in 1998. The fishing was great but the light was terrible so in honor of the old boat I thought I'd make the photos look old, too. My buddy Capt. Mike Bartlett down in Key West loves fishing for big barracuda and just wrote a great article about protecting this very unappreciated gamefish. Click here to read it and please pass it along to your friends. It's that time of year again, when the chilly air and high winds from the north push down and blow the water off the flats during the lowest tides. I really don't enjoy fishing in these conditions and I even cut a full day charter short yesterday after it became a lost cause with 30 knot gusts around 11AM. But this doesn't mean you can't catch fish before, during and after a nasty cold front and the photos above show just that. Just remember that the reds will stack up in the potholes and channels right outside the flats that they frequent during ideal conditions. The fish in these pics were landed in three foot holes near Smokehouse and Buzzard Bay at the bottom of the negative lows. Dropping Gulps into any good looking pothole is a great way to haul out a slot-legal red or really big trout over the next few months. If you use live shrimp or cut bait you'll be even more effective but expect more than your share of catfish, too. Some shots from the last two days. Great new for all you fly anglers: the waters of Pine Island Sound are clearing up beautifully and some nice schools of redfish are still cruising the grass flats out there. I spent the last three days fly fishing with angler Terry Rusthoven who splits his time between Colorado and Central Florida. We found piles of big reds in Orange Pass and on the flats near Cabbage Key but getting them to eat a fly was a real chore. The few that did eat were over slot fish that took deer hair sliders and spoon flies dropped right on their heads. If you're out there tossing live bait you should be sick of catching them by now. Here's another well done video by Chris Lewis over at Skinny Water Culture. This was shot somewhere in the Keys and features some impressive catches with a fly rod made even more impressive since he was using a Bote Paddleboard. The music isn't bad on this one either. Long Paddle from Chris Lewis on Vimeo. After I posted Part 1 last week I got an e-mail from my friend Doug Furnback with these photos from his trip to Venice with his son Wes. It's just not fair.